Fast forward a few weeks. I was cleaning out my freezers, doing the annual purge and wonderment at what can be found in the depths of a forgotten freezer. Where does this stuff come from? As I excavated a large Ziploc containing three separate bags of roasted peanuts without any recollection on how they ended up there, I instantly thought about that brittle. 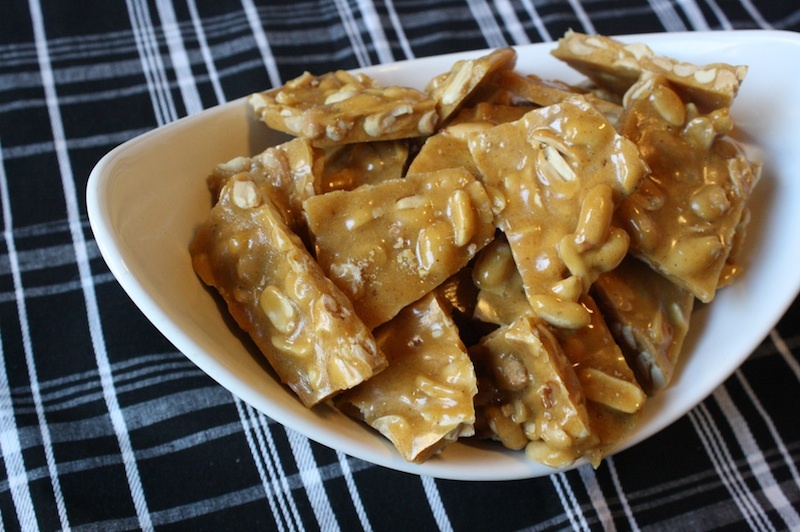 It just so happens that tomorrow is National Peanut Brittle Day so I figured, what the hell, I’ll make a batch for such a momentous occasion. This is classic in the most basic sense – caramelized sugar with that characteristic airy, crunchy texture from the addition of baking soda. Butter and vanilla add a nice flavor but I like things with a little zip, so I added a bit of ground cayenne and chipotle pepper. It lends a nice, subtle heat that lingers on the palate toward the end, just a little bit. Not terribly spicy by any means but just enought to make you sit up and take notice. If you like things very hot or if your ground spices aren’t terribly fresh, add more. I have also amassed quite the salt collection and used a bourbon smoked sea salt here, which was quite nice but regular sea salt or even kosher would suffice. – Always have a bowl of ice water nearby in case any of the hot sugar should, god forbid, get on your hands. Plunge your hand directly into the ice water. – Have all your ingredients ready to go – measured, chopped and standing by. Hot caramelized sugar waits for no one. – Use a big enough pan. Nothing is worse than cleaning up a hot sugar boil over. And be aware that when you add liquid and the baking soda to the mixture, it will foam up by at least double. – Make sure your spatula is heatproof. The second worst thing, after a boil over, is to have your spatula melt in the hot sugar. – Use a candy thermometer. While you can test the sugar mixture in a bowl of water for hard crack, it’s much much easier to read a thermometer. However, if you don’t have nor want a thermometer, you can do the bowl method. Read my post on Caramel Corn Rice Krispie Treats for more details on exactly how to do this. – When using a candy thermometer, have a glass of water nearby. When the candy hits the right temp, you have to move fast and the last thing you want to worry about is where to put the hot sticky thermometer. Into the glass is goes, mess free and makes for an easy cleanup later. – The easiest way to clean a sticky caramel coated pot is to fill it with water and bring to a boil. The caramelized sugar will dissolve making cleanup a breeze. Line a rimmed sheet pan with a silpat mat or piece of parchment and set aside. In a large, heavy saucepan, combine the sugar, corn syrup and water, then cook without stirring over medium heat to hard-crack stage, about to 301-302°F, or until a small amount of candy dropped into a bowl of cold water becomes hard and brittle. As the mixture begins to brown, gently swirl the pan or stir to even out the browning. Immediately remove from heat and quickly stir in the peanuts, butter, sea salt, vanilla, baking soda, cayenne and chipotle until well blended. Be careful – the butter, vanilla and baking soda will cause the mixture to bubble furiously. 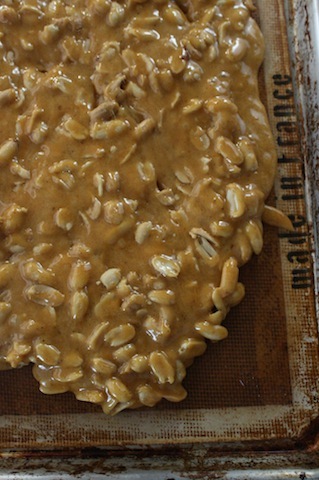 Pour the mixture onto the prepared pan and working quickly with the spatula or with two forks, pull/spread the brittle out to a large rectangle about ¼” thick. Once cool, break into pieces. To cool quickly, slide the silpat or parchment sheet off the sheetpan and onto a cooling rack (the sheet pan will retain heat for a while.) Store in a tightly covered container at room temperature. Keeps for 2 weeks; do not refrigerate. Like it’ll last two weeks. Ha! 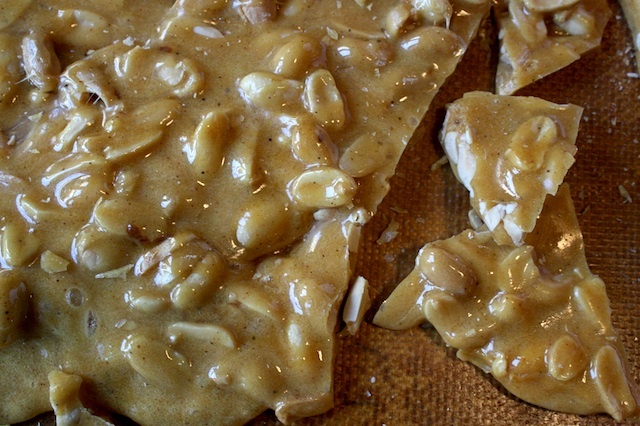 My Grandma make the best peanut brittle. She adds unsweetened coconut (pencil shaving sized pieces). I should try making some for myself if I can find the coconut.